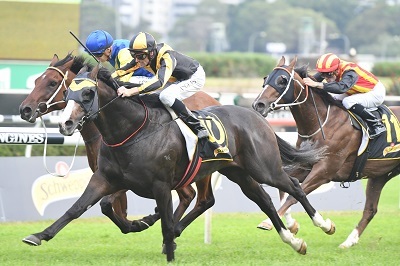 As Everest favourite Trapeze Artist steps up his work towards a September 8 return to racing, trainer Gerald Ryan is bullish about stablemate Menari impressing slot holders when he resumes a week earlier. Ryan confirmed the Group 2 Theo Marks Stakes (1300m) at Rosehill as base camp for Trapeze Artist’s Everest mission. He’ll then tackle the Group 2 Premiere Stakes (1200m) at Randwick on September 29 and the $13 million The Everest (1200m) third-up on October 13. “He’s coming along well, working along running half miles in 54.5 or 55 seconds and doing it well,’’ Ryan said. Everest favourite Trapeze Artist will resume in the Group 2 Theo Marks at Rosehill on September 8. Pic: Steve Hart. Trapeze Artist ($4.50 with TAB) was the first horse locked in for The Everest, by Aquis Farm, and Ryan said while 1300m first-up may appear strange it’s the preparation that best suits the rising four-year-old. “It’s three weeks to the Premiere and two weeks to the Everest,’’ he said. Trapeze Artist will likely have his first trial either at Randwick on July 30 or Rosehill on August 7. Another good reason for Trapeze Artist missing the Concorde and Shorts is that’s where Ryan plans to give any remaining slot holders a look at Menari. The Group 3 Concorde Stakes (1000m) is run on September 1 and the Group 2 The Shorts (1100m) on September 15 - both races were won last year by inaugural Everest champ Redzel. The boom colt hasn’t raced since finishing third behind Trapeze Artist in the Golden Rose last September after a fetlock injury kept him out of the autumn. Five slots remain open – Coolmore, whose contenders could become clearer after Saturday’s July Cup at Newmarket in the UK, the Australian Turf Club, James Harron and Max Whitby. The fifth belongs to GPI Racing and whether that slot is up for grabs will likely depend on Chautauqua’s Flemington jump out on Friday where he needs to have one of his two embargos lifted for failing to leave the gates. “If anyone saw him now they’d take him,’’ Ryan said of Menari. Menari remains on the $26 line with TAB for The Everest and Ryan is under no illusion as to the task he’ll face should he gain a start – but he’s equally sure Menari is up to it. All seven confirmed runners have won Group 1 races in the 2017-18 season – Redzel (Darley Classic), In Her Time (Galaxy), Trapeze Artist (TJ, All Aged, Golden Rose), Shoals (Myer Classic, Robert Sangster, Surround), Santa Ana Lane (Rupert Clarke, Goodwood, Stradbroke), Brave Smash (Futurity) and English (Doomben 10,000). “It’s a good race, you wouldn’t mind having any of the horses in your back yard,’’ Ryan said.